Glenn asked me to reply on his behalf. 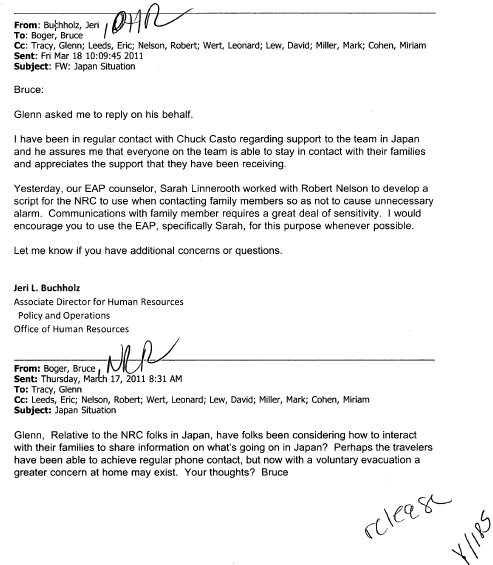 I have been in regular contact with Chuck Casto regarding support to the team in Japan and he assures me that everyone on the team is able to stay in contact with their families and appreciates the support that they have been receiving. Yesterday, our EAP counselor, Sarah Linnerooth worked with Robert Nelson to develop a script for the NRC to use when contacting family members so as not to cause unnecessary alarm. Communications with family member requires a great deal of sensitivity. I would encourage you to use the EAP, specifically Sarah, for this purpose whenever possible. Let me know if you have additional concerns or questions.